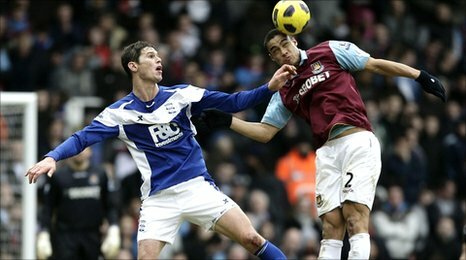 Birmingham leaped out of the Premier League's bottom three with a crucial win over fellow strugglers West Ham. Nikola Zigic scored the only goal of the game when he headed in Sebastian Larsson's free-kick on 65 minutes. West Ham's Demba Ba came off the bench and also almost marked his debut with a goal but his shot hit the post. Birmingham had their defence to thank for a clean sheet, although they were lucky to escape when Manuel da Costa shot off-target and then headed wide. The hosts went close on several occasions with Victor Obinna and Robbie Keane impressive in the first half, yet they had trouble carving out many clear openings and the defeat leaves them at the bottom of the Premier League on goal difference, two points from safety. It is a huge blow for the Hammers after encouraging displays in their last two games where they beat Blackpool and Nottingham Forest in the FA Cup. Birmingham were also victorious the last time these two teams met, thrillingly overturning a deficit in the second leg of the Carling Cup last month. Didn't we look better in last 10 mins? But with both sides in the Premier League's bottom three before the game began, the three points at stake made for a cagey match. West Ham were the more threatening to start with Obinna, fresh from five goals in his last two games, at the heart of much of the hosts' good work. The Nigerian forward lined up on the left of a front three with Keane in the middle and Frederic Piquionne on the right, and it was from Keane's lay-off that the former Portsmouth striker curled a shot straight at Ben Foster on 20 minutes. 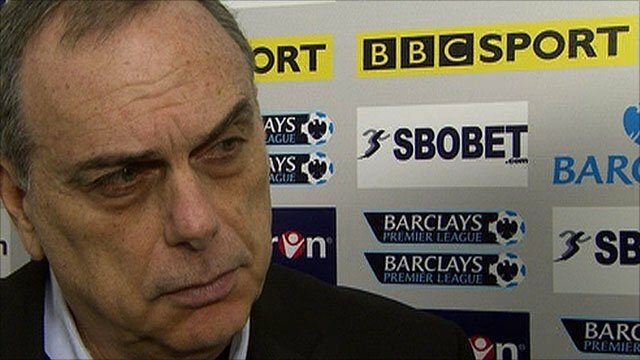 The Irishman's ability to hold the ball up and find space in congested central areas was a help to Avram Grant's side, and his lay-off allowed Obinna to shoot left-footed but he was off-target. For Birmingham, David Bentley attacked with purpose on a couple of occasions and shot over early on, but Alex McLeish's midfield were struggling to link up with the front pair of Zigic and Cameron Jerome. Grant had to make a last-minute change to his starting line-up with Matthew Upson replacing the injured James Tomkins in the heart of the defence but Upson, himself, could only last until half-time. Da Costa replaced the England defender and it wasn't long before he was under pressure when Bentley found Zigic but the Serbian's header was wide. 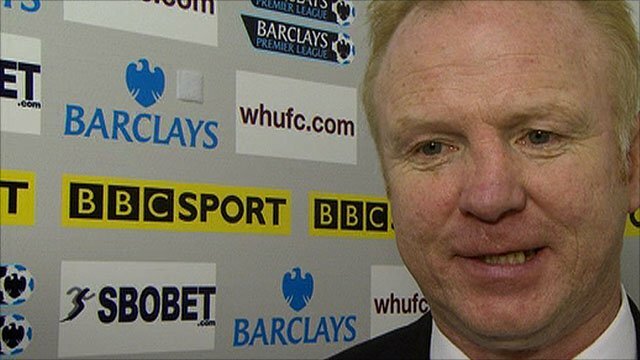 McLeish then made what looked like a negative decision to take off Jerome and replace him with midfielder Larsson just before the hour. But the Swede justified the faith his manager showed in him when his set-piece from the left was headed in at the back post by Zigic - his sixth goal of the season. West Ham argued that the free-kick awarded to Birmingham was a soft one, with Mark Noble barging over Bentley, but the appeal emphasised the growing frustrations of the West Ham supporters. The hosts had several penalty shouts too but, in truth, referee Chris Foy was about right to deny them, including a push on Keane and handballs where the ball struck Birmingham defenders from point-blank range. Carlton Cole replaced the increasingly ineffective Piquionne with Keane switching to the right, but the introduction of Senegalese forward Ba almost had an instant impact when he hit the post following a free-kick. Urged on by an expectant crowd, West Ham were pressing for the equaliser, but struggled to produce any further saves from Foster. And as Birmingham retreated, it was left to defender Da Costa to help out in attack. He had a long-range shot which left Foster scrambling across goal, and then his far-post header was narrowly wide. Zigic then almost doubled his tally near the end after good hold-up play, but shot straight at Robert Green and, even though he was not involved for long periods of the game, his telling contribution proved decisive. West Ham left the field to boos at the end and they will now need to reinvigorate themselves to exit the drop zone once again. 90:00+4:03 The referee blows for the end of the match. 90:00+3:15 Foul by Manuel da Costa on Roger Johnson, free kick awarded. Ben Foster takes the direct free kick. 90:00+2:59 The offside flag is raised against Nikola Zigic. Robert Green restarts play with the free kick. 90:00+2:25 Foul by Manuel da Costa on Stephen Carr, free kick awarded. Direct free kick taken by Ben Foster. 90:00+2:25 Booking Manuel da Costa is cautioned by the ref for unsporting behaviour. 90:00+1:28 Victor Obinna concedes a free kick for a foul on Barry Ferguson. Ben Foster takes the free kick. 90:00+1:28 Booking Victor Obinna receives a yellow card. Correction - 90:00+0:07 Victor Obinna produces a right-footed shot from just outside the box that misses to the right of the goal. 90:00+0:07 Victor Obinna has shot on goal from just outside the box which goes wide of the right-hand upright. 89:41 The assistant referee signals for offside against Nikola Zigic. Direct free kick taken by Robert Green. 88:29 Manuel da Costa has a headed effort at goal from deep inside the area missing to the right of the target. 86:23 Sebastian Larsson challenges Wayne Bridge unfairly and gives away a free kick. Free kick taken by Lars Jacobsen. 85:33 Victor Obinna takes a shot. Ben Foster makes a save. 84:31 Shot by Nikola Zigic. Robert Green makes a save. 83:59 Unfair challenge on Barry Ferguson by Victor Obinna results in a free kick. Roger Johnson takes the free kick. 82:44 Corner taken by Mark Noble from the left by-line. 81:28 Gary O'Neil takes a shot. Ben Foster makes a save. 81:08 Manuel da Costa takes a shot. Save by Ben Foster. 80:05 Corner taken left-footed by Wayne Bridge. 78:14 Foul by Wayne Bridge on Stephen Carr, free kick awarded. Ben Foster takes the direct free kick. 76:25 Gary O'Neil fouled by David Bentley, the ref awards a free kick. Wayne Bridge delivers the ball, Shot by Demba Ba from inside the penalty area bounces off the post. 74:56 Nikola Zigic challenges Manuel da Costa unfairly and gives away a free kick. Free kick taken by Robert Green. 74:56 Substitution Demba Ba replaces Robbie Keane. 74:03 Winston Reid fouled by Nikola Zigic, the ref awards a free kick. Lars Jacobsen takes the direct free kick. 73:13 Booking The referee shows Ben Foster a yellow card. 72:11 The assistant referee flags for offside against Carlton Cole. Ben Foster takes the free kick. 70:00 Corner taken right-footed by Sebastian Larsson from the right by-line, Manuel da Costa makes a clearance. 66:35 Shot by Sebastian Larsson from deep inside the penalty area misses to the left of the goal. 64:53 David Bentley fouled by Mark Noble, the ref awards a free kick. The assist for the goal came from Sebastian Larsson. 64:53 GOAL - Nikola Zigic:West Ham 0 - 1 Birmingham Nikola Zigic fires in a goal from inside the six-yard box to the bottom right corner of the goal. West Ham 0-1 Birmingham. 63:36 David Bentley fouled by Manuel da Costa, the ref awards a free kick. Free kick taken by Sebastian Larsson. 62:28 Outswinging corner taken by Sebastian Larsson from the right by-line. 60:58 The official flags Nikola Zigic offside. Robert Green restarts play with the free kick. 60:24 Free kick awarded for an unfair challenge on Roger Johnson by Carlton Cole. Roger Johnson takes the free kick. 58:43 The assistant referee signals for offside against Nikola Zigic. Robert Green restarts play with the free kick. 58:43 Substitution Frederic Piquionne goes off and Carlton Cole comes on. 57:28 Sebastian Larsson takes a outswinging corner from the right by-line to the near post, Lars Jacobsen manages to make a clearance. 56:16 Foul by Manuel da Costa on Lee Bowyer, free kick awarded. Free kick crossed by David Bentley. 56:16 Substitution Sebastian Larsson comes on in place of Cameron Jerome. 52:44 Free kick awarded for an unfair challenge on Manuel da Costa by Cameron Jerome. Robert Green restarts play with the free kick. 50:37 Nikola Zigic produces a header from close range which goes wide of the left-hand post. 49:20 Cameron Jerome gives away a free kick for an unfair challenge on Winston Reid. Robert Green takes the free kick. 48:15 Victor Obinna takes a shot. Roger Johnson gets a block in. 46:35 Manuel da Costa takes a shot. Ben Foster makes a save. 46:01 Barry Ferguson challenges Victor Obinna unfairly and gives away a free kick. Mark Noble restarts play with the free kick. 45:01 Substitution Manuel da Costa is brought on as a substitute for Matthew Upson. 45:00+1:16 The referee blows for half time. 45:00+0:40 Shot on goal by Robbie Keane from inside the box goes harmlessly over the target. 45:00+0:12 Victor Obinna takes a shot. Roger Johnson gets a block in. 41:25 Robbie Keane is caught offside. Liam Ridgewell takes the free kick. 40:32 Corner taken by Lee Bowyer from the left by-line. 39:54 Unfair challenge on David Bentley by Mark Noble results in a free kick. Ben Foster takes the free kick. 39:54 Booking Booking for Mark Noble for unsporting behaviour. 38:55 Foul by Martin Jiranek on Frederic Piquionne, free kick awarded. The free kick is swung in right-footed by Mark Noble, clearance by Nikola Zigic. 37:25 Free kick awarded for a foul by Cameron Jerome on Winston Reid. Winston Reid restarts play with the free kick. 35:57 Winston Reid has a headed effort at goal from deep inside the area missing to the right of the target. 35:23 Inswinging corner taken right-footed by Mark Noble from the left by-line to the near post, clearance made by Lee Bowyer. 34:31 Headed effort from inside the area by Nikola Zigic misses to the left of the goal. 33:30 The referee blows for offside. Indirect free kick taken by Scott Parker. 31:55 Headed effort from deep inside the penalty area by Roger Johnson goes harmlessly over the crossbar. 30:47 Corner taken right-footed by David Bentley, save by Robert Green. 30:07 Lee Bowyer takes a shot. Robert Green makes a save. 29:10 Mark Noble produces a right-footed shot from just outside the penalty area that goes harmlessly over the target. 28:17 The ball is crossed by Gary O'Neil, save made by Ben Foster. 27:19 Frederic Piquionne gives away a free kick for an unfair challenge on Liam Ridgewell. Ben Foster restarts play with the free kick. 26:37 Unfair challenge on Martin Jiranek by Winston Reid results in a free kick. Direct free kick taken by Ben Foster. 25:56 Inswinging corner taken right-footed by Mark Noble, Cameron Jerome makes a clearance. 22:57 Mark Noble gives away a free kick for an unfair challenge on Craig Gardner. Ben Foster takes the free kick. 20:46 Victor Obinna produces a left-footed shot from just outside the box that goes wide right of the goal. 19:49 Curled right-footed shot by Frederic Piquionne. Ben Foster makes a comfortable save. 18:59 Gary O'Neil produces a volleyed right-footed shot from 30 yards. Ben Foster makes a save. 18:09 Unfair challenge on Scott Parker by David Bentley results in a free kick. Direct free kick taken by Mark Noble. 16:46 Free kick awarded for an unfair challenge on Roger Johnson by Frederic Piquionne. Ben Foster takes the free kick. 15:41 Frederic Piquionne gives away a free kick for an unfair challenge on Liam Ridgewell. Ben Foster restarts play with the free kick. 14:34 Craig Gardner has an effort at goal from outside the penalty box missing to the wide left of the goal. 13:46 Foul by Liam Ridgewell on Lars Jacobsen, free kick awarded. Wayne Bridge takes the direct free kick. 11:46 Free kick awarded for an unfair challenge on Craig Gardner by Mark Noble. Liam Ridgewell takes the free kick. 10:35 David Bentley concedes a free kick for a foul on Matthew Upson. Robert Green takes the direct free kick. 9:31 Robbie Keane concedes a free kick for a foul on Barry Ferguson. Barry Ferguson takes the free kick. 7:50 David Bentley has an effort at goal from just outside the area which goes wide of the left-hand post. 6:28 Frederic Piquionne challenges Liam Ridgewell unfairly and gives away a free kick. Free kick taken by Ben Foster. 3:54 Roger Johnson challenges Wayne Bridge unfairly and gives away a free kick. Wayne Bridge crosses the ball from the free kick left-footed from right wing. Correction - 2:36 Inswinging corner taken by Mark Noble, Robbie Keane takes a shot. Stephen Carr gets a block in. 2:36 Mark Noble takes the inswinging corner, Robbie Keane takes a shot. Blocked by Stephen Carr.